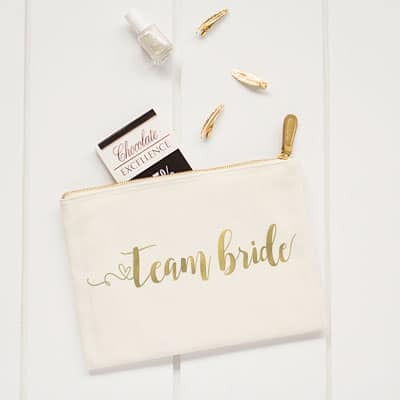 When it comes time to ask your girls the all important question of “will you be my bridesmaid?” what better way than with our gorgeous Gold Foil Team Bride Canvas Clutch? 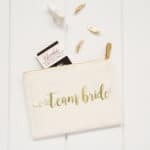 When it comes time to ask your girls the all important question of “will you be my bridesmaid?” what better way than with our gorgeous Gold Foil Team Bride Canvas Clutch? 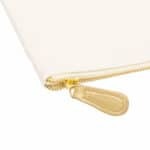 Featuring stunning faux leather accents and a zipper closure, this durable canvas clutch is printed with gold script reading “Team Bride”. Perfect for a bachelorette party or a convenient way to carry wedding day essentials, this adorable accessory is a wonderful gift for your best girls. Pair with the Gold Team Bride Canvas Tote for a fabulous gift set! Faux leather accents with a zippered closure.